We are one of the largest commercial aquaponic farms in the U.S. Come learn about the future of food and try our incredibly fresh produce. Aquaponics is one of the sustainable farming methodologies of the future, and the future is now. 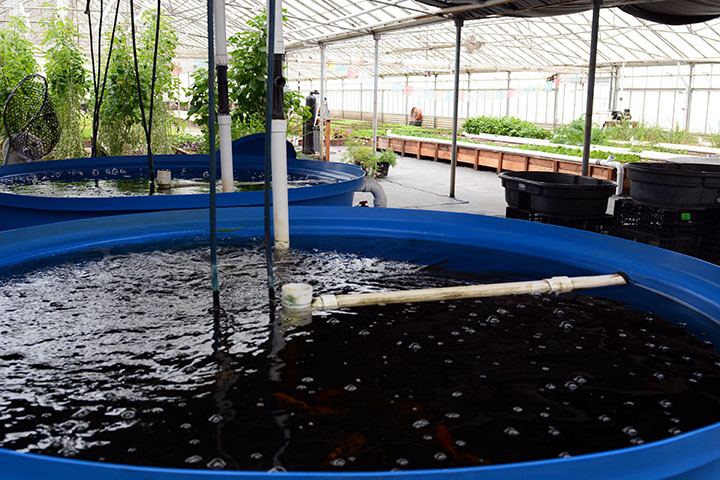 Aquaponics uses up to 95% less water than traditional soil farming. Because water is recycled and used over and over again as it flows through our systems, very little is lost to evaporation, and the only water used is what the plants take up through transpiration. Aquaponic produce grows 30-50% faster because in this natural environment, water and nutrients are brought to the plant and it spends less energy looking for resources and puts it instead into vegetative growth. Aquaponically grown produce can also be grown up to 10 times more densely than soil. 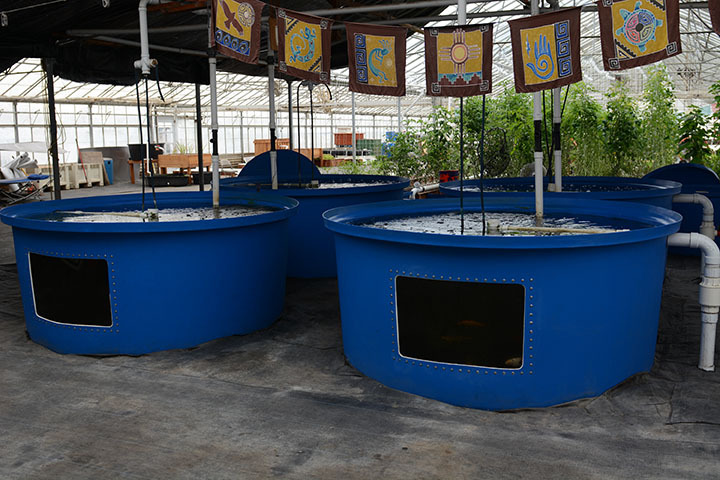 Aquaponics produces fish as well as vegetables, enabling one growing system to provide well balanced nutrition. All these together and you get a system that produces 20 times the vegetable production per square foot (plus fish!) than soil, with a fraction of the water required, and you can do it anywhere! No soil needed, roof tops, empty buildings, parking lots, deserts, green houses, etc. It's important to think of the benefits from a variety of perspectives, that of the commercial buyer, the commercial provider, and from an individual or family grower. Chefs buy our Aquaponic produce for their restaurant because it is local and the freshest, most consistent option they have to get quality produce throughout the year. Commercial Aquaponics is an excellent methodology to address the urgent need for sustainable farming practices as we move into the future. Easily scaled, you can plan your operation to meet your, your family, your friends, or your communities needs. All with the satisfaction of growing healthy, sustainable, vegetables and fish. These vegetables, which include kale, celery and butterleaf lettuce were grown in our aquaponic deep water culture. OUR MISSION: It is our mission to partner with nature by combining the principles of aquaponics and permaculture to bring our customers the freshest, healthiest, chemical-free produce on the planet. HEALTHY: Aquaponically grown produce is made by replicating river and lake ecosystems in a controlled environment thereby creating a living ecosystem that produces incredibly delicious, fresh, vibrant, pure vegetables and fish, all while having a minimal impact on the environment. SUSTAINABLE: Greenhouses local to the people who enjoy their products ensures optimum growing conditions for fresh local food production and vast reduction of travel time, distribution and fuel costs. This promotes food security, food sovereignty, and reconnects people again with the source of their food and the people who grow it.